We specialise in the manufacture and supply of Plain and Printed self adhesive labels in many formats and can print up to six colours on the widest variety of materials available, both adhesive and non adhesive. We can print any label from 1 up to 6 colours on our modern printing presses using a wide variety of materials such as Vellum Paper, Coated Papers, Vinyl, PE, PP, Polyester and many other speciality materials available on the market in permanent, removable, freezer and marine grade adhesives. These labels are produced in both roll and sheets’ using many of our Library stock dies. Our plain labels are utilised in many applications requiring Thermal Transfer, Direct Thermal and Inkjet printers for shipping, warehousing and other logistical solutions. Printed Labels are created using our Digital, UV Flexo and Water based technology and we can offer a variety of printing processes which include adhesive print, back print and cold foil blocking. Many of these labels are bespoke and come in all shapes and sizes for countless products across all industry. Our Digital press is capable of producing multiple items in small quantities which is now more relevant for manufacturers wishing to reduce stocks and who are producing small batches and the biggest saving by far for our customers is the elimination of plate costs. We can also personalise labels for special Occasions such as Valentines Day, Mothers day and those milestone Birthdays or Weddings. JR Labels offer a full range of off the shelf standard sheet labels, including Laser, Inkjet and Copier sheets and we have become well known for this service throughout the Irish Printing Trade for more than 25 years. We also offer standard texts such as Fragile, Warning, For Sale, Sold, Q.C., Hazchem and many other Special Offer / Promotional flash labels. If we can be of any assistance whatsoever in relation to your labelling requirements please do not hesitate to contact us. Founded in 1978 by John Ronald Carson (Ron), J.R. Labels or J.R. Agencies as it was originally named, was set up as a s/a tape, labels and packaging supplies company. Working from home in Rathfarnham, Ron was joined by David Lesware early in 1981. Shortly after, his son Andrew also joined the team. They soon realised there was a strong demand for plain and printed self adhesive labels from the market with only a few companies manufacturing labels at that time. Investing initially in overprinting machinery, we realised the future was in converting and our first printing press was purchased. J.R. Labels as it then became known grew from a small company trading in packaging supplies to that of a Self Adhesive Label Manufacturer with special emphasis on supplying the print and stationery trade. Rapid expansion and increased production required larger premises and we moved to Kellystown Road, Rathfarnham but by 1991 we had outgrown this site and moved to No 23 Clondalkin Industrial Estate. By the mid nineties, we seized an opportunity to develop a custom built 8000 square foot facility following an investment in more modern technology, and we moved to our current location at 9/10 Crag Crescent, from where we continue to operate to this day. Through the highs and lows of tough economic times in the eighties, nineties and the 21st century, our mission and trade ethos at J.R. Labels has always remained constant. are with us for between 18 and 25 years. Why not take a moment to visit our Meet the Team page and find out a little more about the people standing by to help with your labelling needs. Thank you for taking the time to visit us at JR Labels and I very much appreciate your support and loyalty throughout our 40 years in business. 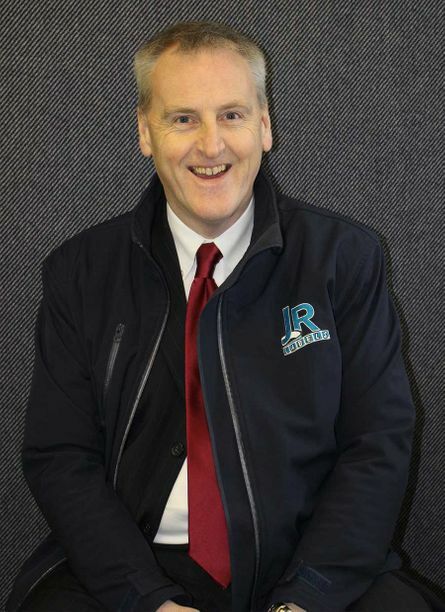 Andrew Carson with 35 years of service is the current Managing Director of J.R. Labels. Very much a hand's on manager Andrew can just as often be found in production operating one of the machines or in the office working on estimates and advising customers about their label requirements. His many years of experience supplying labels to both Trade and End users give him a great sense of satisfaction from the business. While not making labels Andrew's hobby is motorcycling, both on and off road. Over the past number of years he has completed several motorbike trips in the Himalayas, Cambodia and his most recent trip brought him to Vietnam. 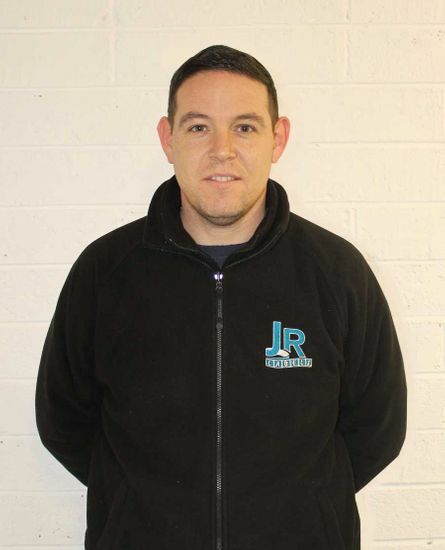 John McGrillen has been with JR Labels for over 18 months . However, John has been working in the label business for 35 years. Throughout his time in the industry, he has held roles in production, quality control, customer service and sales, so he knows labels. His extensive knowledge of materials, the printing process and applications make him an ideal person to speak to about any labels you may require. John is very passionate about labels and is always happy to hear from customers. 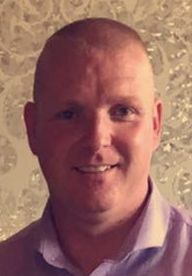 In his spare time, John likes to play Bridge, is a member of Lucan Toastmasters and occasionally can be seen out running. 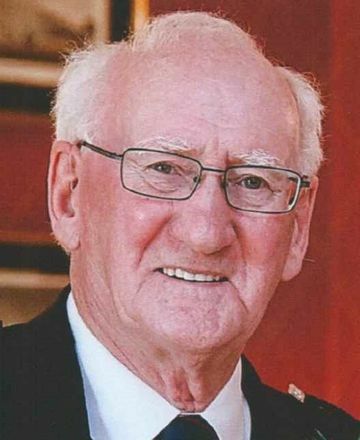 David Duffy is our Production Manager and has been with the company since 1995. 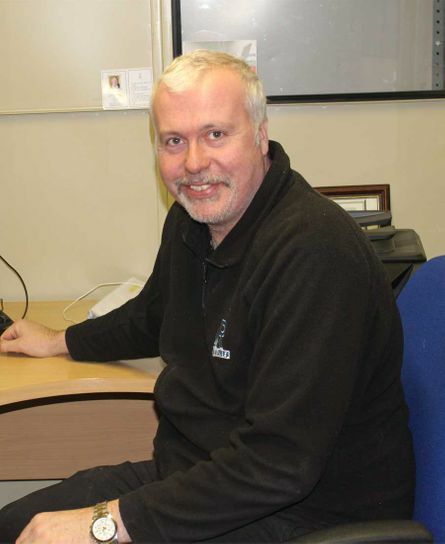 Dave joined us at 16 as a store-man but very quickly progressed to trainee printer within the company and for the past 21 years has gained extensive knowledge and expertise in the business. In his current position managing the production team, Dave strives to provide impeccable print quality and excellent customer service to all our customers. In his spare time he likes to keep fit. In recent years Dave has undertaken many runs in support of numerous children's charities. 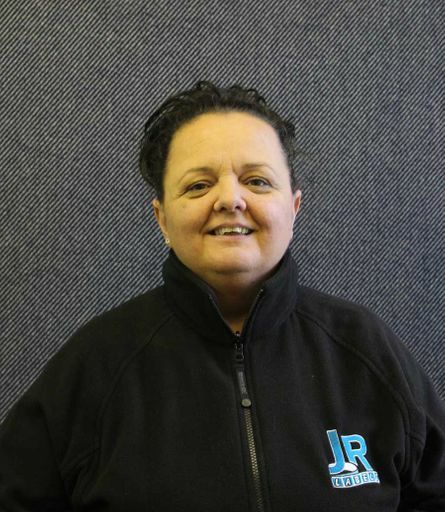 Phil has been with JR Labels for over 21 years and her role as accounts manger is a key aspect to the smooth running of the company. While her main area of responsibility is accounts, Phil's extensive print knowledge enables her to help with any sales queries and her can do approach presents a very positive attitude towards her customers. In her spare time, she likes walking with her dog. Hi I'm Jane Clark. With over 21 years experience within J.R. Labels, I can truthfully say that I have enjoyed every single one of them. In my current role in Customer Service, I am your point of contact between sales and the production department. I love a challenge and this is what keeps my job both interesting and rewarding. No two days are ever the same! Throughout my years with J.R. Labels I have held a number of roles starting as receptionist then purchasing and finally customer service & production planning so I have a very good knowledge of all aspects of the labelling business. When not in work I enjoy socialising and going to concerts of all kinds. 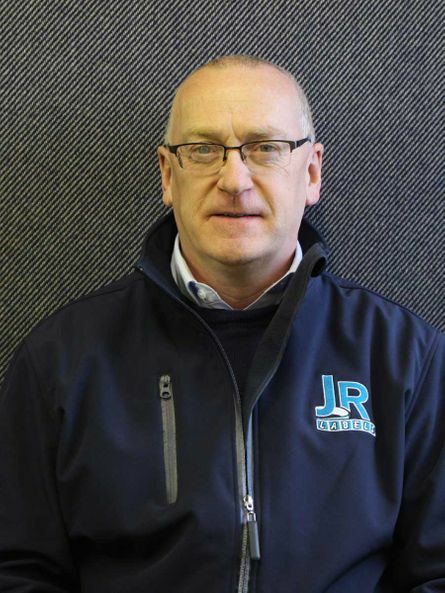 Hi, I’m Stephen Hamm and I’ve been working with JR Labels for 20 years but I have been in the label business for closer to 25 years having worked in another label company prior to joining JR. In my 20 years in JR Labels, I have held a number of positions starting in the warehouse and then as operations manager for 10 years. In my current role, I am responsible for purchasing of materials along with origination of plates & dies and also estimating of jobs for clients. I have extensive knowledge of labels and also get involved helping in production when needed. My main hobbies are music and Liverpool Football Club. Hi, my name is Mark Duffy and I’ve been working with JR Labels for the past 13 years. I started as a general operative in the print room and have worked my way up to my present role as printer on our Mark Andy presses. I am prepared to help in any aspect of the process, from printing and slitting to finishing and packing in order to get the job done and I always do my very best to help customers where I can. My Hobbies included Boxing and playing football. I also have 2 young kids who keep me very busy at the weekends.